Decided to make lunch from garden vegetables. Products available,potato, carrots,beets, beet tops, onion, cucumber, tomato.The beet tops were steamed, beet roots boiled, potatoes baked, Carrots steamed, cucumber raw in vinegar, onion raw in vinegar. Tomato was sliced. Garnish was butter and vinegar. A delicious meal. Simple to prepare probably an hour in time. 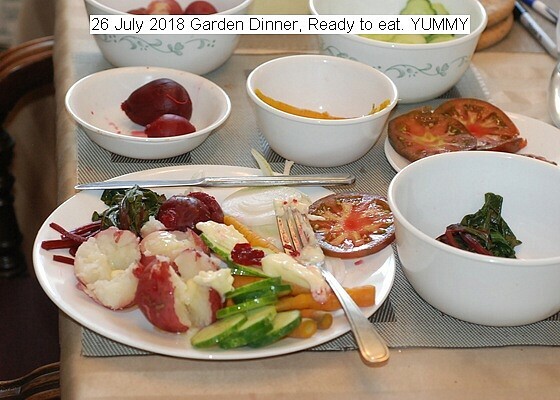 This entry was posted in Uncategorized and tagged 26 July 2018 Garden Vegetables (Dinner), Garden Vegetables (Dinner). Bookmark the permalink.